"My Stuff Tote from Sassy Saks keeps your essentials beautifully organized— and makes a great gift bag, too! 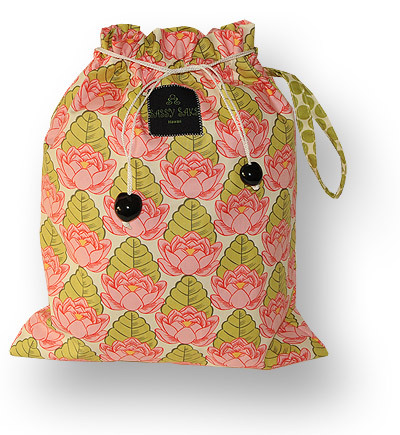 Lots of fun styles to choose from, each with a waterproof nylon lining and kukui-nut finish to the drawstring. 100% cotton, 16”x14”, $38 at Hale Zen, 180 Dickenson St., Lahaina; (808) 661-4802"
"Forgive us if we go overboard about Sassy Saks' Starburst Cosmetic Bag. No problem if we do— its zipper top and waterproof lining keep everything safe and dry. The 100% cotton bag coordinates with larger totes, and comes in two sizes: 5"x8" (shown, $20( and 9"x10" ($24) at Spa Moana, Hyatt Regency Maui, 200 Nohea Kai Dr., Kaanapali; (808) 667-4725."